If you’re one of those people who might have heard of the Voyager missions in passing – maybe while reading up on planets on Wikipedia, or in an astronomy book, you’re most likely to think that the Voyagers are history – they were launched such a long time a go and they’re literally far gone. However this book gives a different perspective to it. Yes, the probes were launched in 1977 – a long time ago for me, but the book brings to life the whole “feel” of the missions, as you read about the teams behind Voyagers. That is something that I very much appreciated while reading this book, that it gives it a human perspective. Does a spacecraft or telescope make discoveries? No, no matter how much we might anthropomorphize the spacecrafts in use, they are still just tools (Believe me, it’s difficult to write, I’m as likely as the next nerd to consider my telescope’s feelings or think that my computer is being moody when it’s not responding), that are used by people to do a job. In The Interstellar Age you get to live through all the planetary encounters, and what’s fascinating is, that you see it through the eyes of the author who got a chance to be there when the data from those encounters reached Earth. That in itself isn’t maybe spectacular, but what is, is that you get the point of view of someone who appreciates the missions and the work and data, while not having a large hugely important role to play at the time. I enjoyed this book a lot, having read S. J. Pyne’s “Voyager” a couple of years before, it wasn’t all new to me, but a lot of it was – maybe I’d forgotten a lot of what I’ve read about the missions before (there’s a tiny chance of that happening), but it was interesting to read. Especially reading about how the golden record came about and reaching termination shock. 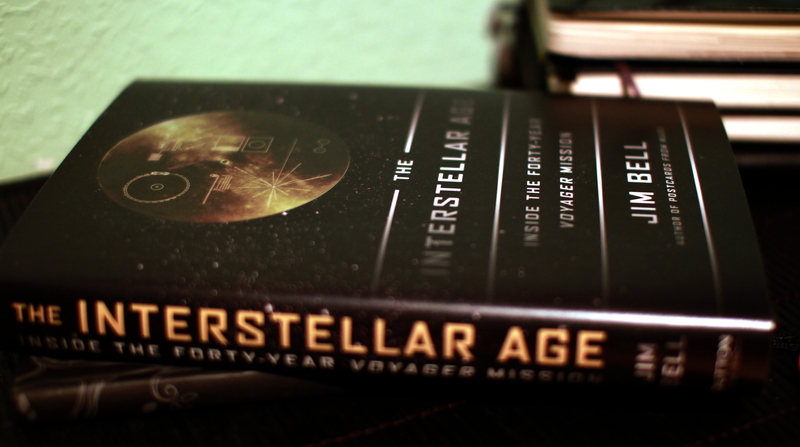 Also I liked the authors last points that he made in the book – that the Voyager spacecrafts are probably going to outlast humankind and as such are in a way a monument to it, and all the other spacecraft that leave the Solar system are as well, and it is a somewhat poignant realization. Just to think that maybe it would eventually encounter life, and some kind of life form will hear the sounds of Earth and see the pictures, when maybe there’s been a runaway greenhouse effect on the planet and all life here has died – then the spacecraft are in a way a tiny blip of a description of an artwork that was destroyed…. Ok, but back to the book – you do find out what was discovered during the Voyager missions and learn more about the people who worked then and now with it. This entry was posted in Astronomy, history of science, Non-fiction and tagged astronomy, book review, books, Jim Bell, The Interstellar Age, Voyager. Bookmark the permalink.